Hats off to fire safety! Guaranteed you'll be the top dog when you show up with Sparky® Fire Hats. They are a terrific way to get kids to join Sparky's fire safety team! 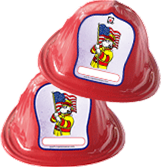 These Fire Hats are made of a sturdy fire engine red plastic and feature a colorful Sparky the Fire Dog® emblem front and center. As an added bonus, the Sparky emblem features a space for the child to write in his or her name! Kids can't get their paws on the official Sparky the Fire Dog Fire Hats fast enough! Kids will wear them again and again. Every time you see a child wearing one you'll remember the important fire safety lessons you taught them. Sparky Fire Hats are the perfect giveaway at schools, community outreach events, and at station tours. Hats off to heroes big and small!